When you are in San Pedro and want great food, and relaxing atmosphere ….just follow the signs to this awesome little jewel…. “Brooklyn Brothers Bagel Shop.” Arriving today to see the recent completion of their new expansion was a great surprise. 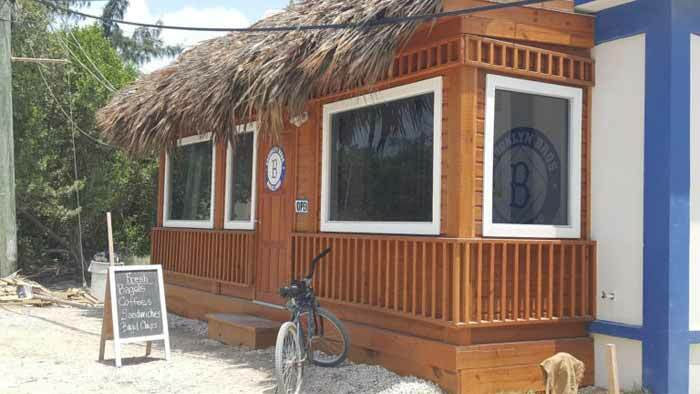 The new air-conditioned area with large windows, bar stools and counters were the perfect addition to this quaint island bagel shop. I go there quite often, as the combination of bagels, an assortment of gourmet cream cheese spreads and a variety of drink options….you are guaranteed to find a favorite quite easily! Fresh fruit smoothies, coffee, lattes, juice, and sandwiches, easily make this place a perfect destination for breakfast or lunch. Brooklyn Brothers Bagel Shop is located just south of town in San Pedro in the old Sausage Factory building. Just next to the island famous Caye Coffee.